The University of Georgia ordered 11,500 “books” in January, for the 12 year in a row! They’ve ordered as many as 22,000 per year. We hear they’re setting enrollment records using BookWear as a college recruiting giveaway. They love this little package. It gets mailed out like a postcard to accepted students. It’s a surprise that lands on their desk and gets their attention. They read it and open it. The back of this cover says “Commit to Greatness”. 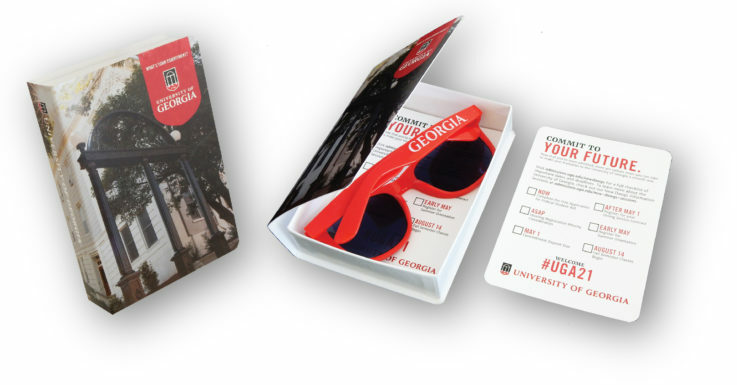 Inside are Georgia sunglasses and a card titled “Commit to Your Future” with a list of dates and actions the student needs to take. It makes Fun and Effective college student recruiting! It works! We want to help you get customers like this! 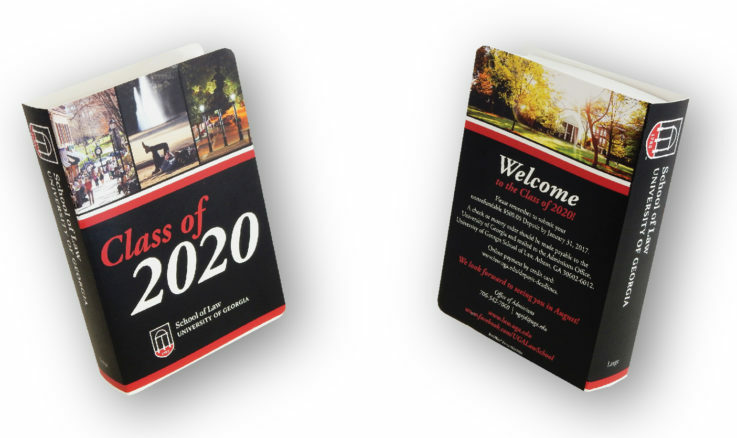 In addition to their general admissions “book” (above) The University of Georgia School of Law also uses BookWear® for recruiting. 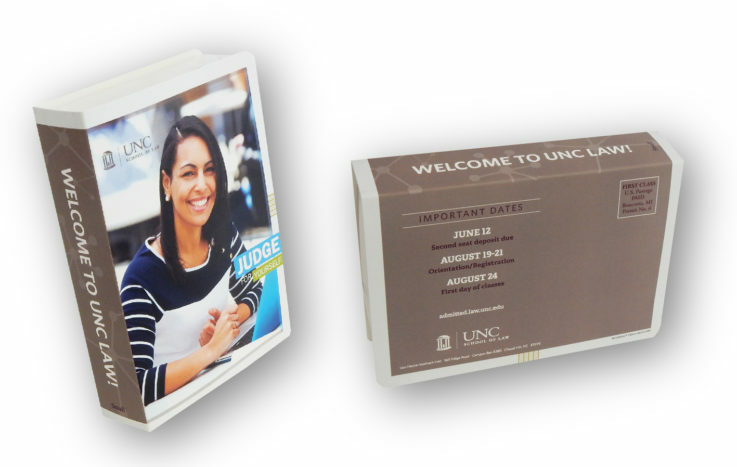 This cover has a big “Welcome” to new students on the back along with dates and addresses for application. Like UGA, the University of Southern California admissions department has also used BookWear® for 12 years, and their Gould School of Law does too. Great minds think alike, because BookWear® works so well as recruiting giveaways for college students. 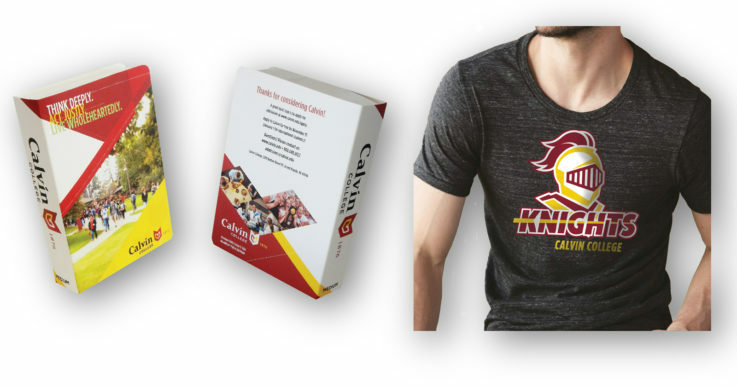 That’s the title of the 2016 edition of the Calvin College book with their “Knights” T-shirt inside. We can all hope to live by this creed. It’s a surprise recruiting gift package for their prospective students. They’ve ordered this package with their message on it for six years. 3,900 pieces this year. It can be mailed like a thick postcard. The back of the book has instructions for applying, with dates and contact information. It’s a complete package for a warm welcome and a “Thanks for considering Calvin!”. They get a high yield with this fun, surprising and creative “book”. This has been Oglethorpe University book title for SIX YEARS straight. It is sent to prospective students as a recruiting giveaway with a T-shirt inside. 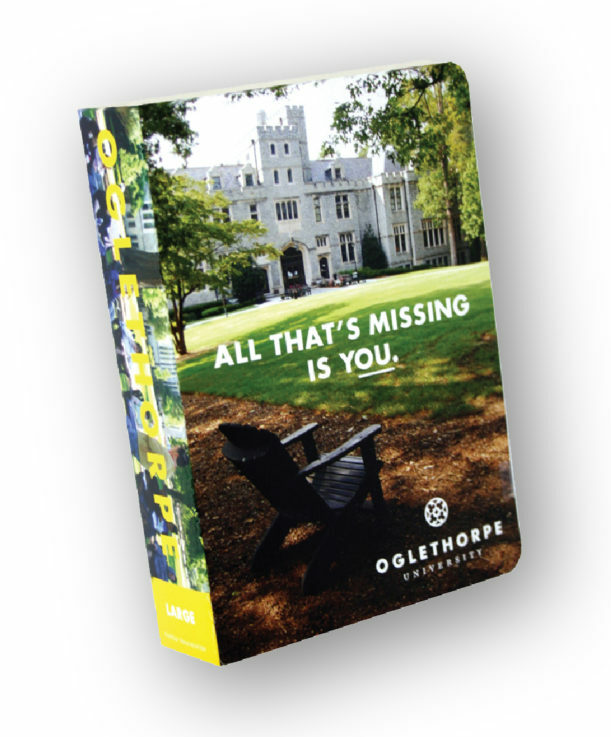 But Oglethorpe is not “missing” these students. They’re getting them because this book has a huge open rate and gets their attention. Oglethorpe keeps ordering because it works. Any organization benefits from a novel approach to their story. It’s the ONLY WAY to get attention! Social and virtual media is everywhere so much of it gets lost in the flood. When a tangible, creative piece like this lands on someone’s desk, it gets opened and read! Tell your story, any story, and it gets seen! Leverage the power of BookWear recruiting giveaways for colleges and universities. is the title of this “book” for UNC Law Department. It’s a recruiting piece that is mailed out first class like a thick postcard. This book opens with a big smile on the cover, “Welcome to UNC Law!” is on the spine and Important Dates for application, orientation and first day of classes are listed on the back. It’s concise, well designed and professionally presented, like a legal case should be! Inside was a “UNC Law” T-shirt to spread the smiles and team spirit even farther. A great communications piece for a new student. so competition is fierce for those young adults. One father told us he saved all the recruiting material his daughter received and it totaled 40 pounds. “BookWear® would stand out in that pile” he said. It does. Baruch has recruited with this little book giveaway and a T-shirt inside for eight years. Hundreds of colleges use BookWear® for recruiting and they do it year after year. Admissions offices mail thousands of them like thick postcards to accepted or prospective students. The open rate is huge. And when students put the shirt on they are walking advertising to their peers. 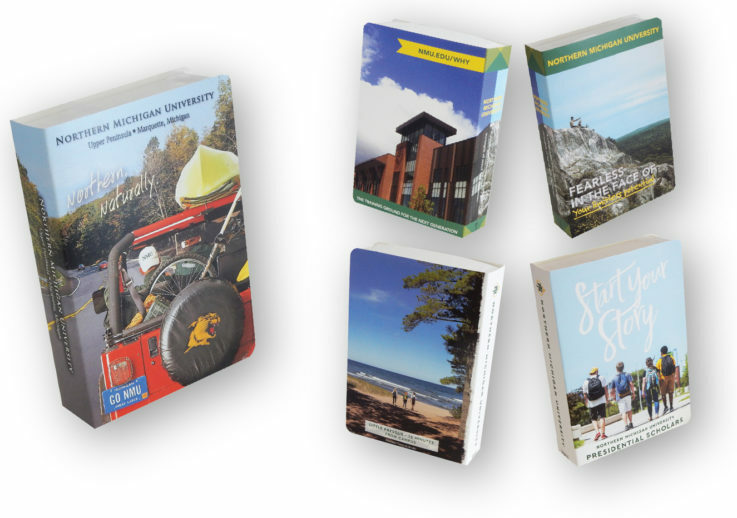 “We get a higher yield with BookWear® than with any other communications” says Case Western Reserve University. Get on this great bandwagon and visit your college admissions and recruiting offices. Every office on campus (Alumni, Medical School, English department, College Housing, etc.). can use this “book” for effective marketing, recruiting and fundraising. when it’s freezing cold in Marquette, Michigan, home of Northern Michigan University. On the shores of Lake Superior, just a hundred miles from where the Edmund Fitzgerald sank in a November gale. This school prides itself in their connection with the great outdoors. It is their brand. Every BookWear® they have done for the last decade has had an outdoor theme sparkling on the cover. There’s the photo of an NMU student driving a Jeep with the top down and every outdoor toy spilling out (kayak, mountain bike, skis, climbing rope, pack, etc.) and “Go NMU” on the license plate. The next iteration shows a couple students perched atop a rocky bluff overlooking a vast forest, juxtaposed by campus buildings on the back cover. The next has “Start Your Story” on the cover with a photo of students on campus. On the back are students walking a Lake Superior beach. This school knows who they are, takes pride in it, and stakes their claim of higher education close to nature. And there’s a surprise T-shirt in every one of these little books. Reunions, birthdays and celebrations are a common BookWear® theme. This distributor reordered a Columbia College book with a “Happy Birthday!” message. Inside was a Columbia College rally towel. An insert card with “We hope you have a great birthday and a fantastic year!” was also tucked inside. This makes for one of the most fun and surprising birthday gifts!